Do you ever wonder how many couples have never met on public transport since they were both too busy looking at their phones? I laughed and then almost carried on my merry way, but the deepness of the tweet (which I’m sure was unintended) hit me: this new age of social media and digital connectedness is really harming our face-to-face interactions. This is something that has been slowly building over the years with the greater adoption of cell phones and particularly smartphones. I remember my days as a Manager at Chick-fil-a. Great company, great job, and wonderful co-workers…but horrid customers. I cannot express to you the utter disdain we had for customers who would come through the drive-thru or walk-in that were talking on their cell phone. We just wanted to slap the thing right out of their hands! If we struck them in the process then all the better. Seriously though, it was a major annoyance and a lack of respect for people trying to serve them. Whenever I got one of these customers I would do one of two things depending on my mood: I would either not say a single word to them the entire time or I would say everything really loud to disrupt their conversation. Sure some people got mad, but what were they going to do? Complain to the manager? That’s me, dufus. Now that I’m more removed from the customer service business, this has become less of an issue for me personally. But despite all the many conveniences and benefits that accompany the advent of the smartphone, it also has its ugly underbelly that is reaching pandemic levels in our society. Take a look at any break room in the workplace, any theater before the performance starts, a parent at the park, or people riding public transit*. The majority of the people have their eyes glued to their phone. Myself included many times. Smartphones give us constant access to the world and what is going on. Want to know the score to the basketball game? Not a problem. Within 30 seconds you can find out how bad Lebron James is whooping up on the other team. Right at our fingertips we can access a near infinite amount of information and news. It also helps us stay connected with distant family and friends via Facebook, twitter, and other social media sites. But while this constant connection helps us keep in touch with those at a distance, what is it doing to our relationships with the person right next to us? So going back to the tweet at the beginning. This growing concern is not just negatively affecting our current relationships, but it can also be preventing us from establishing new and worthwhile ones. ** What opportunities are we missing right there around us because we’re too preoccupied in reading that latest status update or tweet? That post isn’t going anywhere, so why do we feel the almost compulsive need to see it right away? Why don’t we just check it later? Now I’m not a neuroscientist by any means, but I know enough about how the brain develops and operates to know that this new digital age has to be directly affecting the physical structure and processes of that precious grey matter up there. And not for the better. Something I often say to clients is that our brain is a wonderful thing that is very good at what it does. One of its main underlying purposes to to continually be more effective and efficient. But that doesn’t mean what it does well is something good. An assassin is very effective and efficient at what it does, but that doesn’t mean killing people is a good thing. The same goes for our brains and this constant connection to the digital world. Just because we can be connected doesn’t mean we should. 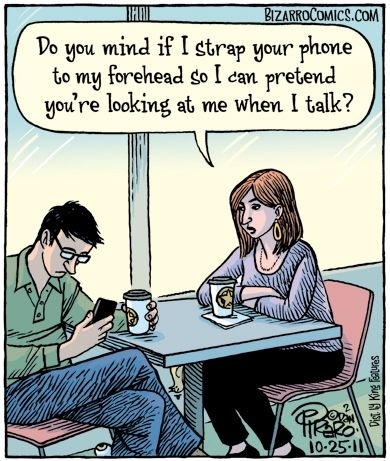 We need to take time to cultivate the interpersonal relationships we have with those near and dear to us because there is nothing sadder than to see a couple during a romantic dinner out looking at their phones instead of each other. It makes me want to slap the phones out of their hands. What grievous infractions have you witnessed with smartphones and our interactions with others? *Personally, unless I know someone on the train/bus with me, I have my headphones in and head down towards my phone screen so any of the crazy people who might be nearby are less likely to talk to me. But that’s just part of living in Atlanta. **Those crazy people on public transit are not worthwhile new relationships we should seek out.